Euromoney Institutional Investor PLC , the international online information and events group, has issued its Interim Management Statement for the period from October 1, 2012 to January 30, 2013. Since reporting its 2012 results on November 15, 2012, trading has continued in line with the board’s expectations as set out in the preliminary results announcement. As highlighted in this announcement, the challenging trading conditions experienced in the second half of financial year 2012 continued into the first quarter of financial year 2013. 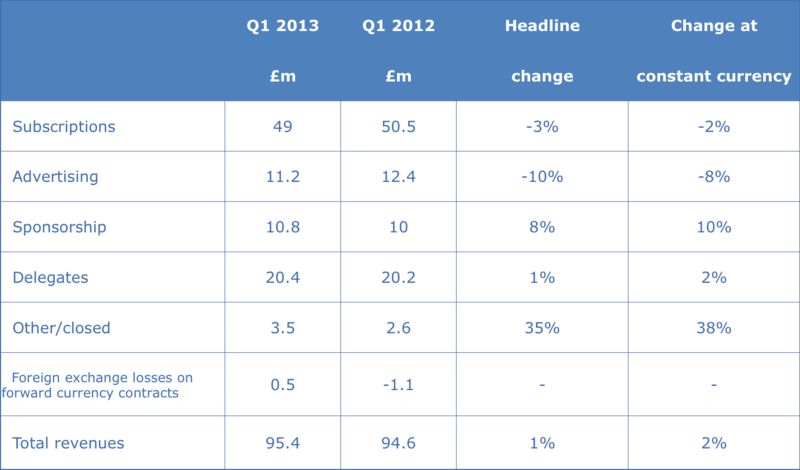 Total revenues for the first quarter increased by 1% to £95.4 million, and by 2% at constant currency. The group generates nearly two thirds of its revenues in US dollars and movements in the sterling-dollar rate can have a significant impact on reported revenues. However, the average sterling-dollar rate for the first quarter was $1.61, against $1.58 last year, and the impact of exchange rates on revenues in the period was therefore not significant. The decline in subscription revenues was in line with the gradual decrease in growth rates experienced since the end of 2011. The decline in advertising was consistent with the trend seen in the second half of financial year 2012, while the return to growth in sponsorship and delegate revenues largely arises from new events added to the portfolio. The increase in other revenues partly reflects the settlement of content redistribution agreements in respect of previous years. There was no significant change in the group’s adjusted operating margin during the quarter. The performance of advertising, sponsorship and delegate revenues is closely aligned with the calendar budget cycle of most customers, which lags the group’s financial year by one quarter. As the new calendar year starts, global financial institutions are continuing to take a cautious view of the outlook and managing their budgets for marketing, training and information buying accordingly. The impact on the group’s revenues is difficult to determine so early in the calendar budget cycle, but recent sales trends suggest the outlook for advertising and delegate revenues will remain challenging, while the trends in subscription and sponsorship revenues are more stable. Net debt at December 31, 2012 was £26.5 million, a decrease of £4.3 million since the year-end. The first quarter is traditionally the one with the lowest operating cash flows because of the payment of annual profit shares and other incentives in December. The only significant capital outflow in the period was the £5 million acquisition of TTI/Vanguard, the private membership forum for senior executives who lead technology innovation in global organisations (see RNS announcement on January 7, 2013). The final dividend for financial year 2012, if approved by shareholders at today’s Annual General Meeting, is payable on February 14 2013 in the amount of £18.3 million. This compares to a cash payment of just £4.8 million in February 2012 when a scrip dividend alternative was offered. As reported at the time of the 2012 results, the first 50% of awards under the CAP, the group’s long-term incentive scheme, will vest on February 14 and be satisfied by the issue of approximately 1.75 million new ordinary shares and a cash payment of £7.5 million. Trading conditions have not changed significantly since the group announced its 2012 results. The uncertainties over Europe and general concern in the financial services industry worldwide remain, while global financial institutions continue to cut costs, particularly people, and exit parts of their business in order to rebuild their balance sheets and satisfy tougher capital requirements imposed by regulators. The board expects these challenging conditions to continue for the foreseeable future and will continue to manage the business tightly. At the same time, the group will maintain its strategy of building a robust, tightly focused online information business with an emphasis on emerging markets, investing in new products and digital publishing to drive organic growth, and using its strong balance sheet and cash flows to fund further acquisitions. The results for the six months to March 31 will be announced on May 16, 2013. The company intends to issue a pre-close trading update on March 22. « Haynes Publishing Group announces interim results for the 6 months ended November 30, 2012.